Senior Patrick O’Hayer has co-authored a paper in the Journal of Neuroscience titled, “Tumor Necrosis Factor-Alpha Is Produced by Dying Retinal Neurons and Is Required for Müller Glia Proliferation during Zebrafish Retinal Regeneration.” The paper was published in the April 10 issue of the journal. Since 2009, O’Hayer has worked with David Hyde, The Rev. Howard J. Kenna, C.S.C., Memorial Director of the Center for Zebrafish Research, investigating cellular and molecular mechanisms underlying retinal regeneration in zebrafish (Danio rerio). In zebrafish, damage to the retinal neurons induces Müller glial cells to initiate a complex reaction, ultimately regenerating missing or damaged neurons. The paper discusses how the group identified one of the molecules that dying retinal neurons produced, called tumor necrosis factor (TNF α). TNF α is the first molecule identified in the process that causes Müller glial cells to initiate the retinal regeneration response. Human retinas also produce Muller glia, but human cells fail to spontaneously regenerate. By studying the mechanism of zebrafish retinal regeneration, the Hyde group hopes to find a way to induce a human retinal regeneration response, which holds the promise of repairing damage in a variety of human retinal diseases, such as macular degeneration, retinitis pigmentosa, glaucoma, and diabetic retinopathy. O’Hayer is majoring in biological sciences and minoring in philosophy. He is a member of both the Glynn Family Honors Program and the Biological Sciences Honors Program. He has served as a teaching assistant for Michelle Whaley’s biological sciences laboratory courses and helped her put together a Research Experience for Undergraduate (REU) Program proposal that was submitted to the National Science Foundation. O’Hayer frequently gives presentations about his research on and off campus, and spoke about his research experience at a special event for potential College of Science donors in Chicago. 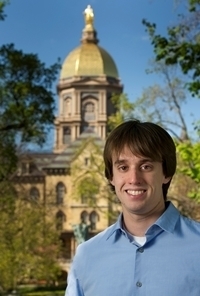 Last year, O’Hayer was named a 2012 Barry M. Goldwater Scholar. He was selected from thousands of applicants to receive the prestigious Goldwater Scholarship for the 2012-2013 academic year. In the fall, he will be attending the University of Michigan to pursue an M.D./Ph.D. dual degree and wants to conduct translational medical research, likely in the field of molecular genetics. Originally published by Stephanie Healey at science.nd.edu on April 29, 2013.